Dan Benjamin, podcaster extraordinare, has been long espousing his Bacon Method, an easy and reliable way to make great bacon. I’ve tried the Bacon Method, and it wasn’t for me. I think I may be alone in this feeling, as I’ve seen numerous people other than Dan espouse Bacon Method. I mean, the thing has its own t-shirt, and that’s not because it’s crappy. You should try it. Seriously. 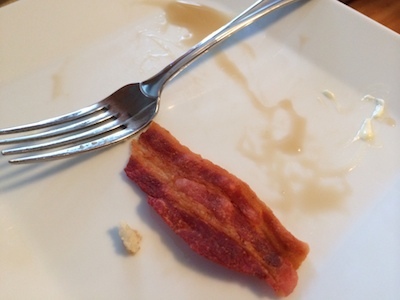 If you prefer a slightly softer bacon, stop closer to 75 seconds. If you prefer crispier, go for the full 90. Naturally, each batch of bacon and each microwave are different, so part of the fun is establishing your own timing preferences. Using the above approach leads to bacon that is not greasy, as well as allowing for reasonably granular crispiness control. Additionally, the whole process takes less than 5 minutes. Further, unlike classical pan-fried bacon, it doesn’t leave the house and clothes smelling for days. I really want to name this post “Non-Standard Bacon Method”, but I fear not everyone that reads it will be in on the joke.